For as little as $249 per user, Foodservice Essentials online training provides essential knowledge about this complex industry. 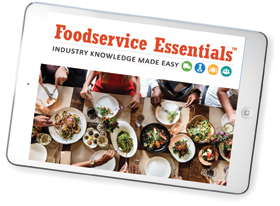 If you have new hires or even seasoned personnel who need more knowledge about the foodservice industry, get them up to speed quickly and affordably with Foodservice Essentials. Technomic’s Foodservice Essentials training program can help recent hires, or even more seasoned professionals, understand the “ins and outs” of this complex industry. In partnership with IFDA and FSMA, Foodservice Essentials covers everything from cutting edge menu and culinary trends to consumer demand and demographics — from building trade relationships to operator segment realities. This groundbreaking program includes 12 learning modules covering a range of foodservice industry information. With a cost of between $249 to $349 for each user depending on the number of users, this valuable education can help your associates work more effectively with trading partners, better understand customer needs, make vital industry connections, and ultimately help build your bottom line. Each module takes approximately one hour to complete and includes a test at the end so managers can see performance. This highly flexible format allows managers to have employees complete modules that particularly fit their employee role, or complete all 12 modules. Plus the education is interactive. Online videos and quizzes provide students with an entertaining and engaging learning experience. For more information or to purchase Foodservice Essentials, contact Technomic at info@technomic.com or (312) 876-0004. For a PDF of Foodservice Essentials information, click here. Industry Overview - Review the definition of foodservice, discover who the main players are (manufacturers, agencies, distributors, operators, consumers), learn the history of the industry’s evolution and the differences from retail. Industry Structure Manufacturers, Distributors - Understand the difference between the manufacturer and distributor’s role in foodservice, what the various types are, and what part agencies/brokers play. Industry Structure Operators - See how the foodservice industry is segmented by type, levels of service, menu specialties, and beyond restaurant channels. Functional Roles & Purpose - Learn the functional areas of an organization, what their responsibilities are, and how they play into the foodservice landscape. Process Flow & Buying Practices (2 parts) - Understand how operators decide what product to order, who to order from, and how that varies by operator segment and size. Also discover how distributors decide what products to order, from which manufacturers, and how category management plays a part in the process. Trading Partner Relationships (2 parts) - Discover how building and maintaining relationships can help grow business. Learn the role of private label, category management, marketing programs, and food shows. Operator Segment Realities - Understand how labor, recruitment, compensation, and marketing affect day-to-day operations. Business Economics - Perceive how value is added by channel members, margins by category and brand types, and differences from retail. Menu & Culinary Trends - Learn the importance of food quality and flavor, define freshness, and discover how trends like ethnic fare, customization, and healthy eating play into foodservice offerings. Consumer Trends & Drivers - Gain insight into key economic drivers, the reasons consumers dine out, demographic differences, and value expectations.